1. 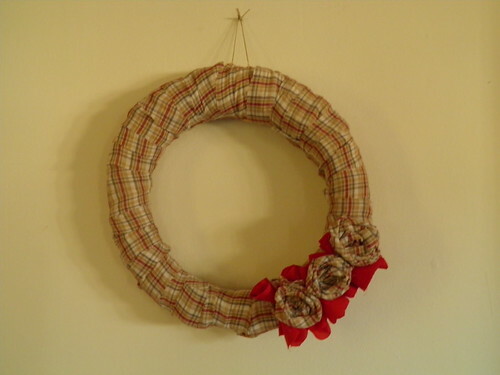 Christmas wreath: starting at the sleeves of the shirt, I cut a bunch of fabric strips. I hot glued each piece down to my thrifted straw wreath (50 cents!!!) as I went, overlapping pieces the whole way. Then, I took three more strips and made three rolled roses. To make the red "foliage," I cut a bunch (maybe a dozen) of squares out of some spare red fabric I had. Fold them in half once, then in half again, and glue them down. You can round the top edges to make it look softer. 2. 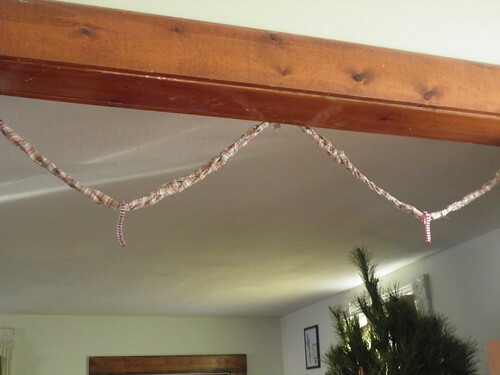 Christmas garland: starting at the hem of the shirt, I cut long strips of fabric about 1-2 inches thick. I tied three pieces together and braided them. I connected two braids in the middle to get enough to go around the doorway. Don't mind the little ornaments. Haha! Though I think it would be neat to hang bulbs from the garland at intervals. Hmmmm. Might try that when I get home. 3. Christmas Forest: The three tall trees I thrifted a couple of years ago. Recently, I found two foam cones at the thrift store. I wrapped each in extra fabric strips from the shirt. I wound the strips around and used sewing pins to hold them down. 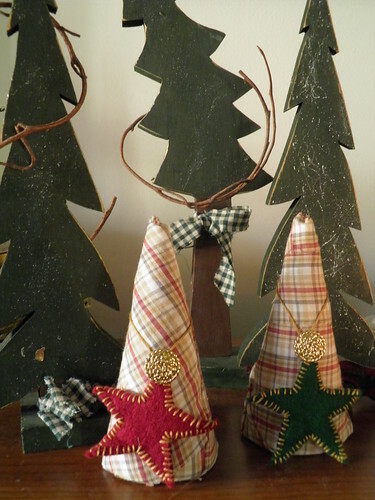 I made the star ornaments several years back with felt and embroidery thread. I hung the last two stragglers on my trees with matching gold buttons for an extra touch. 4. 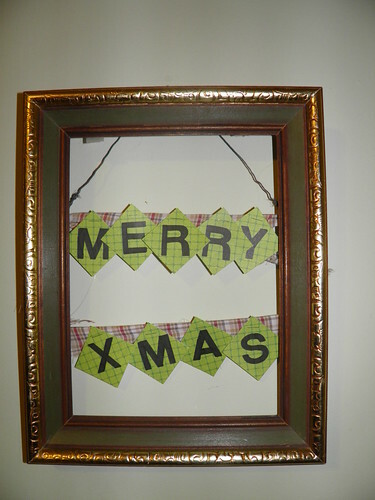 Framed Christmas Greetings: I thrifted this frame for a fun DIY photo shoot at my wine and cheese party last year. I strung two fabric strips from the back of the frame and hot glued them down. I cut out 9 total 2x2 inch squares from some green scrapbook paper I already had. Then, I stenciled in the letters. Then, I just stapled the letter squares to the fabric strips. Voila! Call me the crafty thrifter, this was so much fun! I loved the project, because it formed a color theme throughout the house. The color-coordination makes all the decorations flow together. I still have a little fabric left, so I might have to drum up another project. We shall see. Great ideas! I love the wreath and the trees are so cute too! Way to used up an old shirt:) I am a new follower! Welcome Karen! I'm so glad to have you. Thanks for the kind words.